Today’s card were designed for the Blooms and Butterflies Color Challenge using only Black and White card stock and ink. To view the rest of the design teams cards Click Here! My first card was made using the “By the Tide” stamp set. I used black card stock and stamped using craft white ink. I also jazzed it up a bit using dazzling diamonds and a few rhinestones. 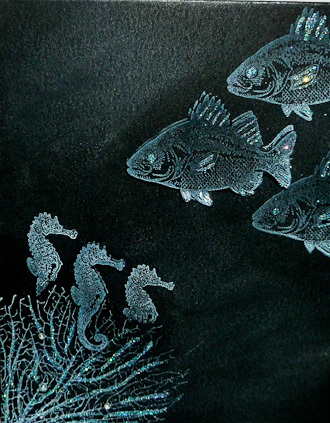 The fish turned out really cool I think using the dazzling diamonds it reminded me of the shimmer on fish. I was thinking of giving this one to my dad for Father’s Day. What do you think? My second card was made using the Best of 25 years set “Best of Brides & Babies”. I used white card and black card stock for this one. 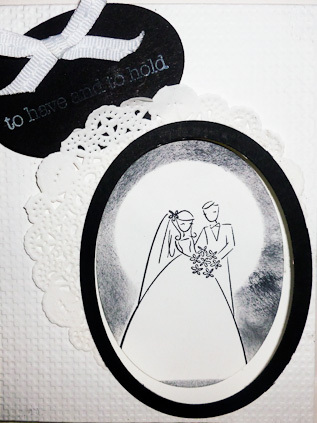 I stamp the Bride and Groom image using the Stazon or you can use Black ink pads. I then masked the image and sponged around it using the black. I also used the oval framelits to create the oval on the front of the card to put the image in the window. I also used 2 framelits to create the black circle to give it a more finished edge. I also used the smaller one to stamp “To Have and to Hold” and added a bit of white ribbon. I also embossed the front of the card using Square Lattice folder. I finished it with a bit of the Tea Lace Paper Doilies.